TRENTON -- In support of Mercer County’s annual U.S. Flag Decommissioning Ceremony that takes place on or around Flag Day, June 14, Mercer County Executive Brian M. Hughes announces that his office of Veteran Services is making available flag disposal boxes. Residents can respectfully dispose of worn flags any time of the year by dropping them in one of three flag boxes, and the county will properly decommission them at the annual ceremony. “Our Mercer County community has reliably respected the time-honored tradition of a dignified disposal of the American flag, and I’m pleased to give our citizens a way to conveniently and respectfully remove a flag from service,” said Mr. Hughes. The disposal boxes, provided to Mercer County by National Association of Counties (NACo), are located Mercer County Connection, Route 33 at Paxson Avenue in the Acme Shopping Center; the Lawrence Headquarters Branch of Mercer County Library on Darrah Lane, Lawrence; and at the McDade Administration Building, 640 S. Broad Street, Trenton. Each year, Veteran Services partners with local veterans to hold the time-honored decommissioning, also known as “flag retirement.” Flag etiquette dictates that American flags that have become tattered, soiled or are otherwise no longer fit for display be burned in a dignified manner. The Hughes Administration and Veteran Services over the past decade have collected tens of thousands of flags eligible for retirement. 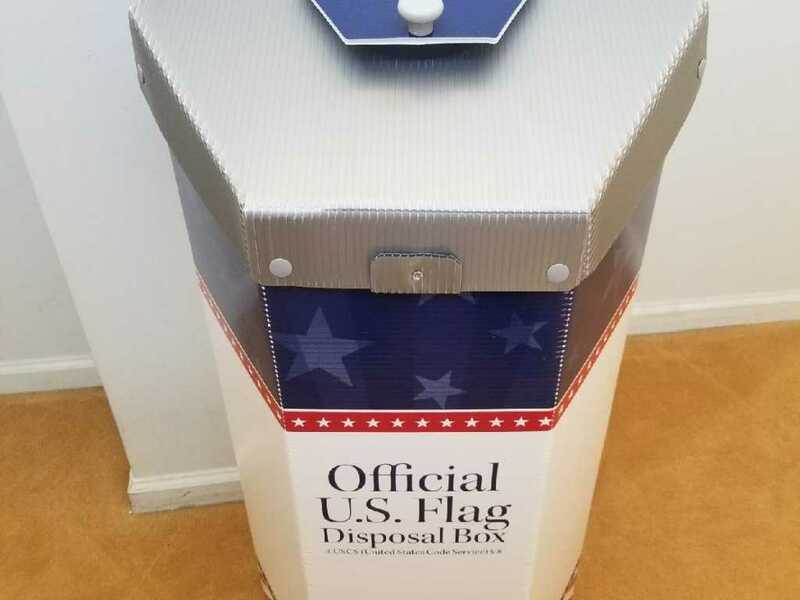 Individuals and organizations wishing to have an American flag properly disposed of should bring the flag to any of the new flag disposal boxes or any Mercer County office, including Mercer County Park Commission Offices or Ranger Headquarters or the Mercer County Veterans Home on Hamilton Avenue, Hamilton. Participation by schools, Scout troops, veterans’ organizations and other agencies is encouraged. The flag disposal boxes are provided through a partnership with NACo, the National Flag Foundation and the National Sheriff’s Association.